The SB-6 portable, light weight shot blast machine features an easy to adjust handle allowing you to push or pull the SB-6. This feature allows you the ability to blast in any corner and under shelving and machinery. The horizontally fed blast wheel design leaves a tapered blast edge pattern which eliminates any striping effect. With the liners and housing on the SB-6 incorporated into one part, it gives you the ability to replace any and all wear components. By interchanging the rear liner, the SB-6 can blast 4 and 5 inch line stripes in just minutes. When connected to the B-101 Pulse Vac you achieve a virtually dust free shot blast system. 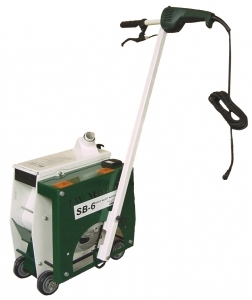 The SB-6 is the unit for all your small shot blast jobs.